We had a fantastic competition at the end of last term as to who could design the most trendy and practical high visibility jacket. We had over 500 entries from the school in total. The winners have been informed and we want to say a big thank you to everyone who took part. As a school we are now crossing the boarder out of Europe and into Asia on our walk around the world. Keep an eye on this space for future exciting events and competitions. This entry was posted in JRSO on January 27, 2017 by mrbryant. Below you will find our fantastic runners up. This entry was posted in JRSO on October 14, 2016 by mrmitchell. Welcome to the JRSO page. We are a group designed to help improve road safety in all aspects. We have an exciting year ahead and we want to get the whole school involved. 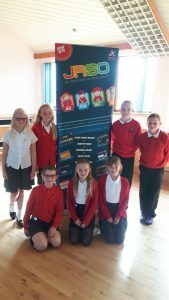 We are currently running a competition to design a JRSO mascot for the school. There are 2 prizes one for P1-P3 and P4-P7. The competition will end on Thursday 13th October. We already have over 200 entries. We have also started an exercise where we are tracking how much the school walks each week on their way to school. We will then track how far that is by aiming to get to new destinations each week. As a school we have already walked from Tranent to Big Ben in London. Next stop is Paris. This entry was posted in JRSO on October 11, 2016 by mrmitchell.